The other week, I found myself in Sydney for work, As you can imagine, when you spend all your daylight hours in the office, there is not a lot of sightseeing that you can do. I wandered the streets at night, and stumbled into the Woolworths opposite the Town Hall. We used to have Woolworths in New Zealand too, but they were rebranded to Countdown years ago. This supermarket in Sydney was a complete shock for me, not just because of its prime central city location and different name (using the same logo as Countdown), but also due to its size and layout, and the kinds of things sold. Beauty section of the supermarket, with a beauty bar counter. 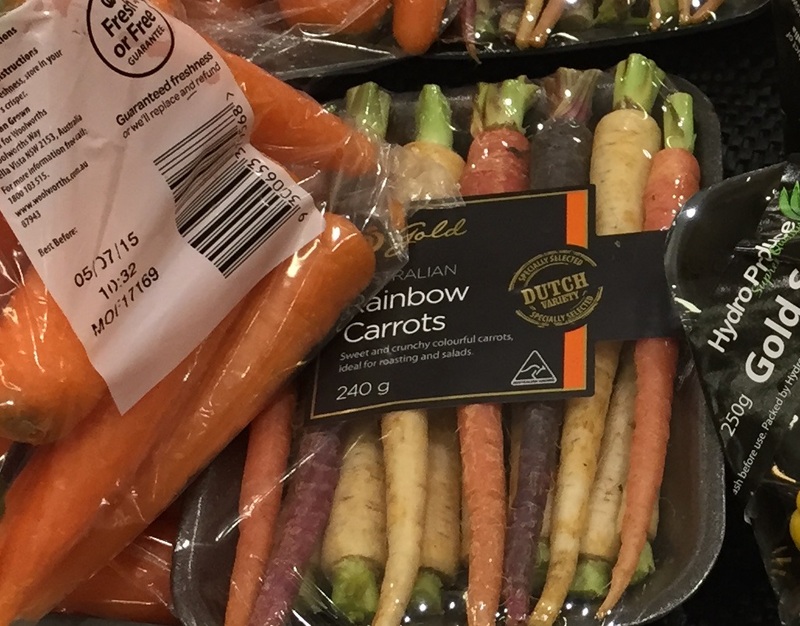 Our supermarkets in New Zealand always seem to funnel you through the fruits and vegies before you can shop for anything else. Not so in the Sydney Town Hall Woolworths. Here, once you walk past the fresh flowers at the entrance, you see the Beauty section on one side, and discounted groceries on the other. To get to your produce, you need to take the escalator down to the basement. Seats in the book section. Even some of the more familiar sections of the supermarket were a bit different. The deli counter had trays of food behind glass and a friendly person to serve you, like the supermarkets I am used to. But you don't just signal one of the staff members and place your order. No, you must first take a number from the ticket machine, and wait for your number to be called. It's a fairer system, I guess, especially for people who aren't good at attracting attention, but it seems a bit over the top unless there are queues of people waiting. Ticket machine and number display by the deli counter. A similar process applies at the busy checkout area, though you don't have to take a ticket. 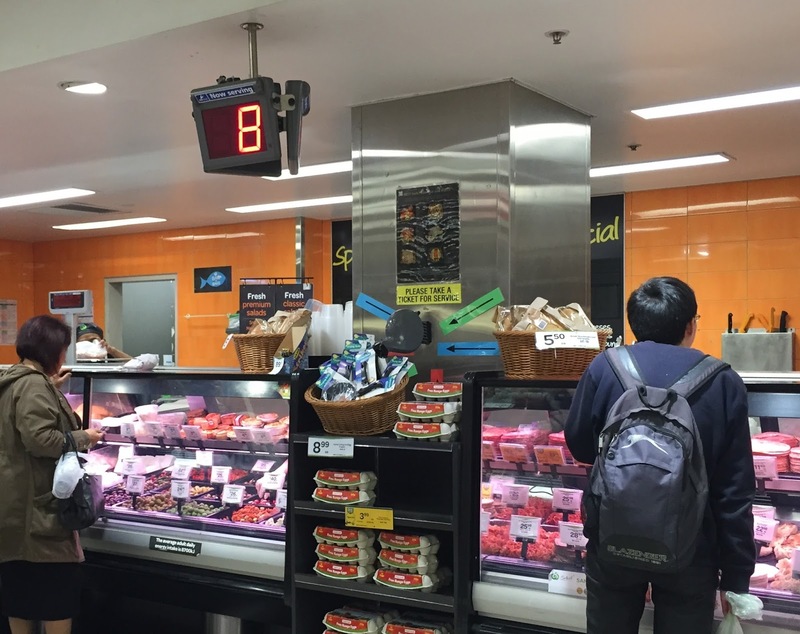 Rather than waiting for shoppers to notice a counter has become free, Woolworths has implemented a more efficient system, with announcements like "Please proceed to register 8". Checkout area with flashing numbers. 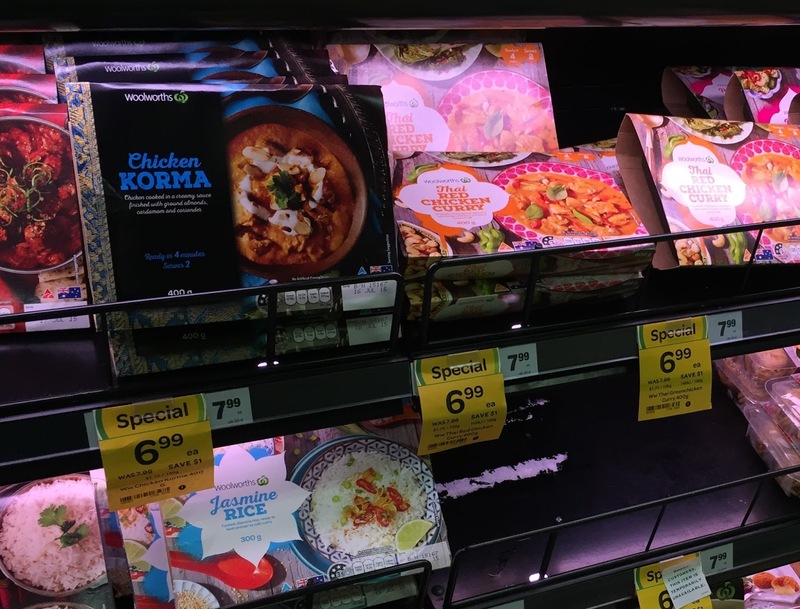 Our Countdown stores already have supermarket-branded items, but in Woolworths, they are even more diverse, for instance used on pre-packaged meals as well. The Homebrand brand is used for the cheapest items, often located on the bottom shelf in plain packaging. Nothing remarkable there. Homebrand eucalyptus lollies, which look like the barley sugars we have here. The Select brand is used for mid-range items. 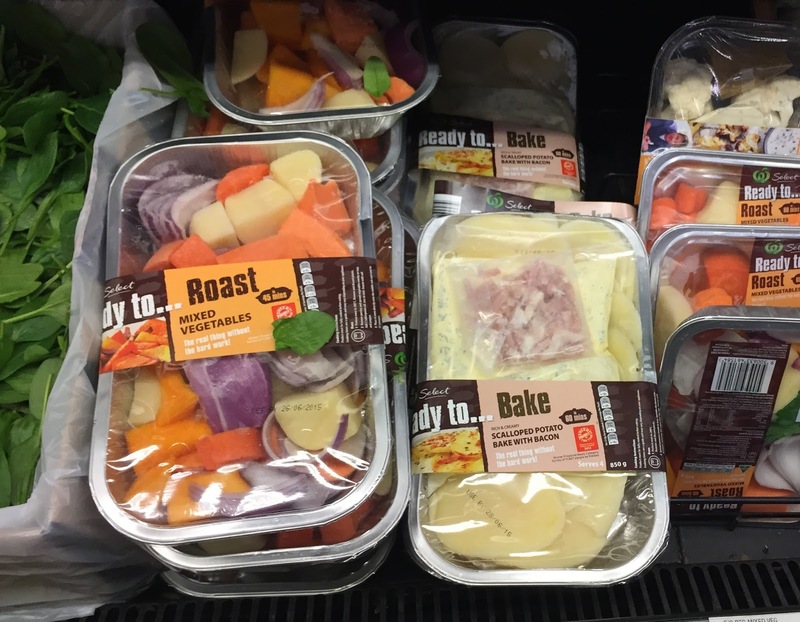 I often buy their crackers in New Zealand, but I was surprised to see the brand used for ready-to-cook packets of chopped vegetables too, including scalloped potatoes (complete with bits of raw bacon in a little plastic bag). This brand is also used for milk, free range eggs, packaged fresh herbs and vegetables, and desserts such as chocolate blocks, baked cheesecakes, sticky toffee date sponge puddings, and macadamia cookies. Select brand permeate free milk. According to their website, this is actually the Fresh brand. 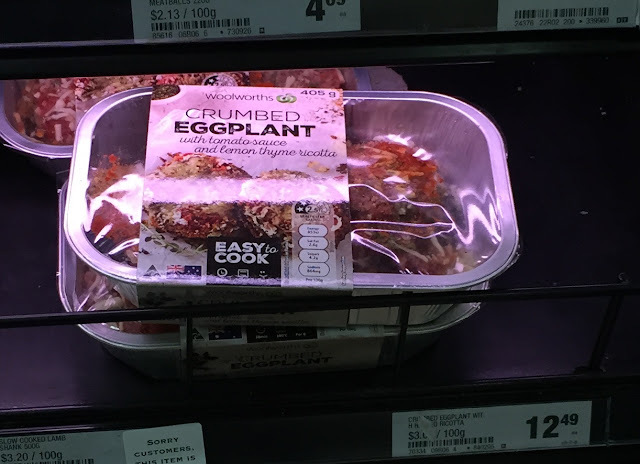 From what I can see, it is used for the more interesting ready-to-cook dishes like crumbed eggplant, and prawn and potato lattice balls. It is also used for purely heat-and-eat meals, with macaroni cheese, beef tortellini, as well as Thai, Malaysian and Indian curries on offer. You can even buy accompanying sides like cooked jasmine or basmati rice, and potato or vegetable mash! Woolworths branded curries and rice. Some of these meals also featured the Emily's Kitchen brand in addition to the Woolworths one, offering items such as beef stroganoff with rice, or breaded camembert. Emily's Kitchen breaded camembert with cranberry sauce. ... to cheese (like Oak Smoked Cheddar, Blue Stilton, Shropshire Blue), to free range sausages (with flavours such as Chicken, Rocket & Parmesan, or Spanish Style Chorizo). Some products displayed the Woolworths logo, but had no other wording. This included packets of Australian pork, beef or lamb, as well as more processed items like macadamia tarts. 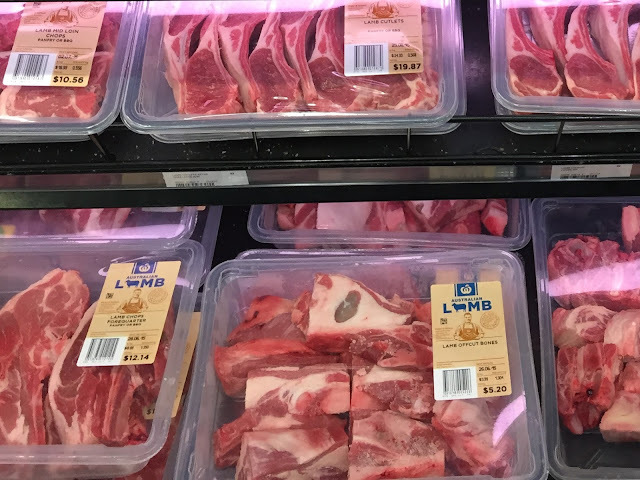 Lamb packs with Woolworths logo. As if the selection of prepared meals wasn't large enough already, you can also buy products with Jamie Oliver's face looking at you from beneath the Woolworths logo. You too can feel like a celebrity chef, as you bake your boneless rolled chicken with chestnut, onion and sage stuffing, fry your one-pan brekkie with chipolota sausages, cook your Indian style cauliflower with minty yoghurt (looked like mainly raw cauliflower florets in the packet), or put together your RSPCA-approved chicken meal kits. Jamie's boneless rolled chicken with chestnut, onion and sage stuffing. 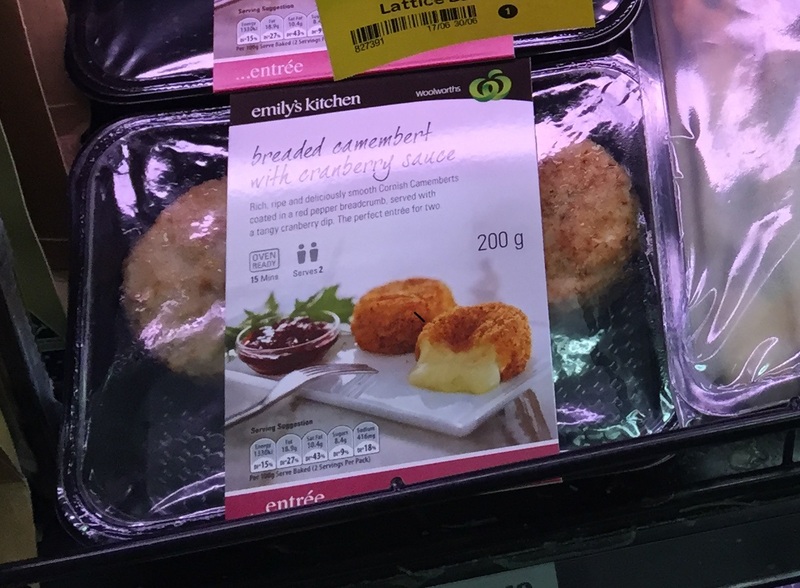 Finally, the Woolworths logo was prominently displayed on products available only at the supermarket chain. This included Houston's Farm salad bowls, as well as Arnott's three bean flavoured Tim Tams. 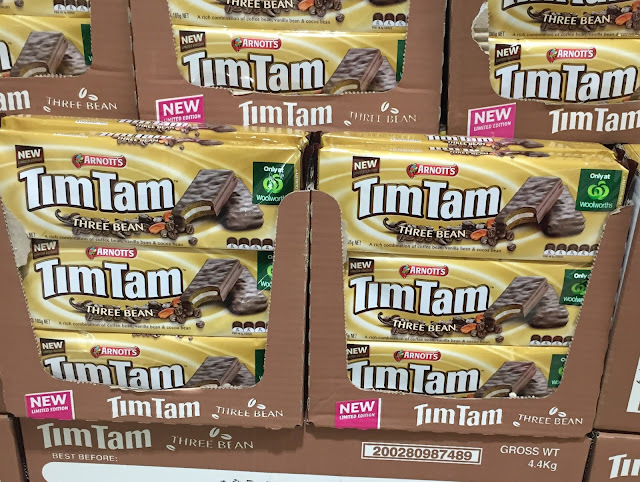 Three bean Tim Tams, only available at Woolworths. I also saw a large Woolworths logo by the limited edition Snickers Rocky Nut Road bars, though it was less clear why. 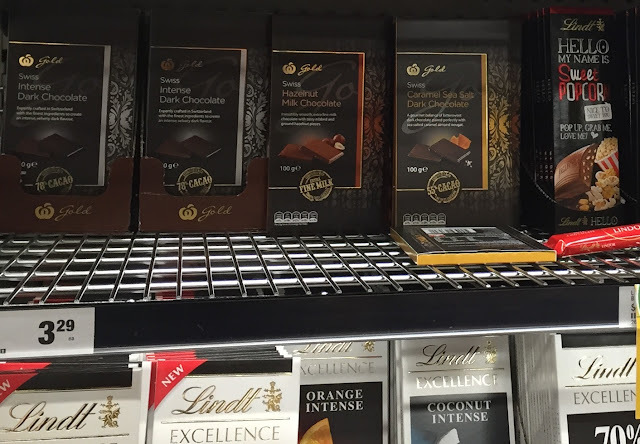 I found these chocolate bars for sale at The Warehouse in New Zealand too. Snickers Rocky Nut Road with Woolworths logo. Apart from the supermarket-branded vegetables mentioned earlier, I was interested to see you could buy Australian grown galangal, custard apples, quinces, pawpaw and papaya, as well as Asian vegies like chokoes, bitter melon, okra, and wombok. Lest you are feeling overwhelmed by healthy goodness, toffee apples have also been introduced to the fruit aisle, lying side by side with normal apples. Toffee apples in the fruit section. There was a length of shelving dedicated to plastic-wrapped organic produce. Turns out Macro is also a brand owned by Woolworths. I would have thought those who buy organic products would be the same people against overpackaging of food, but I guess this is the easiest way to make these more expensive items stand out from their non-organic counterparts. Macro organic plastic wrapped vegies. In the meat department, I was surprised to see turkey for sale (including drumsticks and leg roasts). 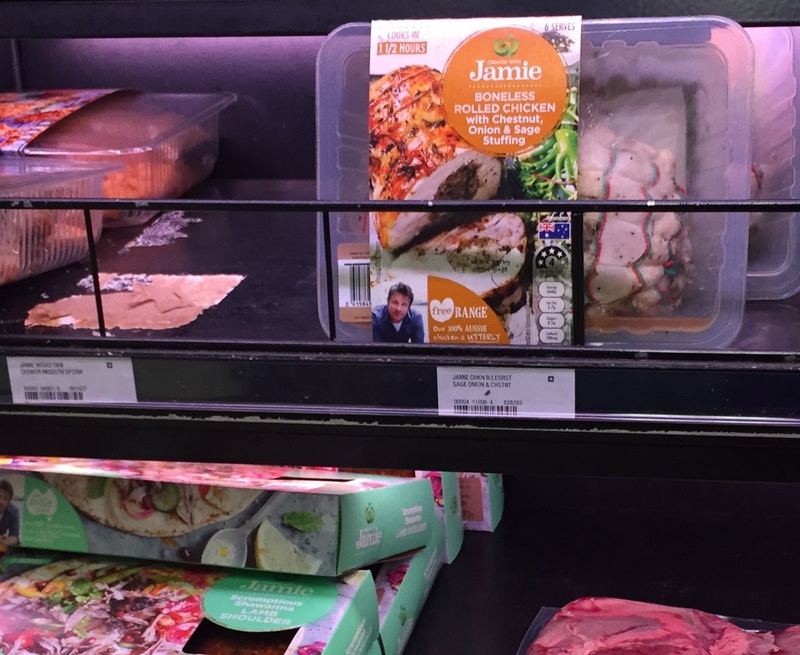 In NZ, such items would only be found at the more gourmet stores like Farro Fresh. Turkey drumsticks, turkey leg roast, burger patties, and jumbo packs of schnitzel. There was a dizzying array of eggs to choose from, from supermarket-branded free range eggs to cage eggs sealed in a plastic sleeve. In New Zealand, you can choose size 6 or 7 eggs, or mixed grade ones, but the in Australia they seemed to come in large, jumbo or XL. Cage eggs wrapped in plastic, and supermarket free range eggs. You could also purchase powdered whole eggs, or egg whites in a carton, including a spinach and feta egg white omelette mix. Maybe that's where the smaller eggs end up. Egg whites in cartons, along with "environmental" cage eggs. The cheese selection was different from what I am used to too, with many kinds of feta, some in 1 kg tubs. I already shared a picture of supermarket-branded milk cartons earlier, but there were many other kinds of milk available, from Farmhouse Gold milk (which sounds the same as our Silver Top) at one end of the spectrum, to "no fat" milk at the other. 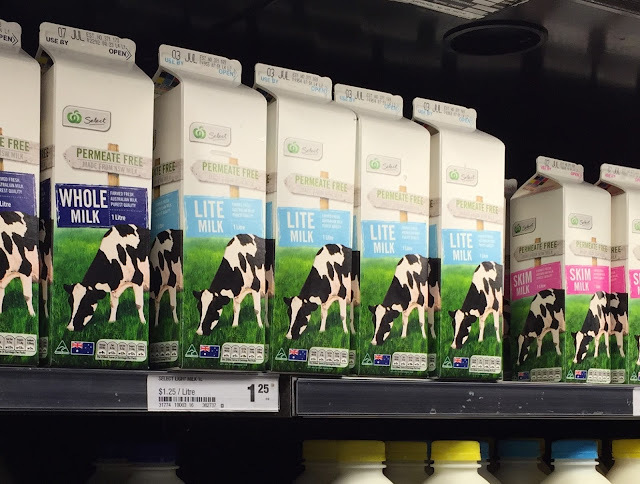 There was also A2 milk (though marketing began in NZ, it did not take off here), lactose-free milk, "easy to digest" milk, HeartActive® milk, and the somewhat racist-sounding "smarter white" milk. Milk alternatives and special milk. For those not wanting to drink cow's milk, you can buy goat milk, as well as non-dairy milks like soy milk, almond milk, rice milk, and coconut milk, all from the chilled section of the supermarket. In the nearby freezers, I came across Ben and Jerry's ice cream, Sealord hoki (specifically marked as "New Zealand Hoki", even though the boxes in NZ just say "Hoki"), and frozen gozleme, which I would love to be able to buy here. I was wondering why there were so many Macro branded products for sale, until I realised Woolworths bought the brand some years back. Entire shelves were dedicated to its organic raw buckwheat, white, red or tri-colour quinoa, chia seeds, and the like. Macro branded nuts and seeds. There were plenty of other products for the more health-focussed too, with many varieties of coconut water, nut shakes, vegetable juices, gluten free items, vegan mayonnaise, and raw nut and fruit bars. At the same time, I have never seen such a vast array of highly processed snack foods for sale. I started throwing Tim Tams into my shopping basket, before I realised there were so many flavours I had not seen before that it was a ridiculous exercise. I finally settled on the three bean and peanut butter flavours (though the latter contains no actual peanuts), rather than the Adriano Zumbo range. 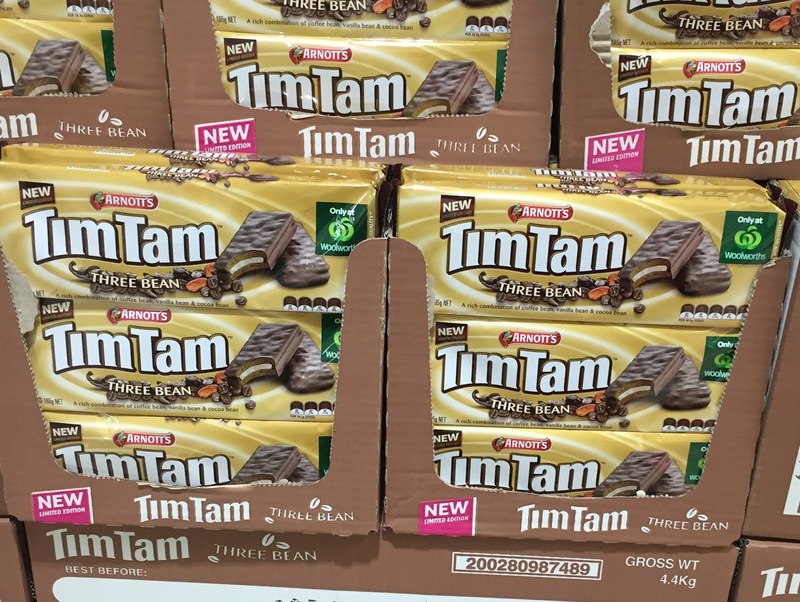 Lots of Tim Tam flavours. You can put your sweets in your yoghurt too. Of course, there were plenty of savoury snacks too. They had flavoured popcorn, which had a round/mushroom shape and came in crazy flavours like sweet chilli and sour cream. Chips were made not only from potato, but also different types of sweet potato as well as beetroot. Even basic things like cream crackers were made strange their name: I would never have guessed what SAOs were. Sweet potato and beetroot chips. Evidently, I am not the only tourist who wanders into the Woolworths opposite the Sydney Town Hall, because there were lots of souvenir items for sale. You could buy kangaroo, koala, crocodile and wombat soft toys, as well as edible gifts like macadamia chocolates and biscuits, with pictures of cute koalas or the Opera House plastered across the box..
Crocodile, emu and kangaroo jerky. I didn't need to buy any of these things though. Just a simple visit to the supermarket has been an eye-opening experience, and I felt I understood more about the city and the people in it. Haha, I shall make it a point to visit every supermarket I come across in my travels. What's special about Aldi? I feel I need to visit more supermarkets now, to see if they are all crazier across the ditch, or whether this one is an anomaly. I like wandering through supermarkets to relax. This post was an awesome read - did you find that the sections seemed to flow in the opposite direction to supermarkets to NZ? I remember thinking it was weird that we hit the fruit and veggie section last.. I certainly noticed that the fruit and vegies weren't the first thing you see. In this case, they were in the basement, and you had to get back to the ground floor to exit the building so they weren't really the last thing either.